Recently my 15 year old and I took a few hours and made a few make ahead freezer meals for kids. He made over 100 freezer sandwiches and over 80 frozen burritos. I made 4 dozen Corndog Muffins for the freezer. All of these freezer meal recipes are perfect for beginners! I’ve been sharing my freezer sandwiches and freezer burritos online for years now. It’s always a blessing when I have them in the family freezer. On this freezer cooking day we made freezer peanut butter and jelly sandwiches and freezer turkey and cheese sandwiches. I take this on homeschool field trips, hikes in the forest, or use whenever sandwiches are needed in real life. 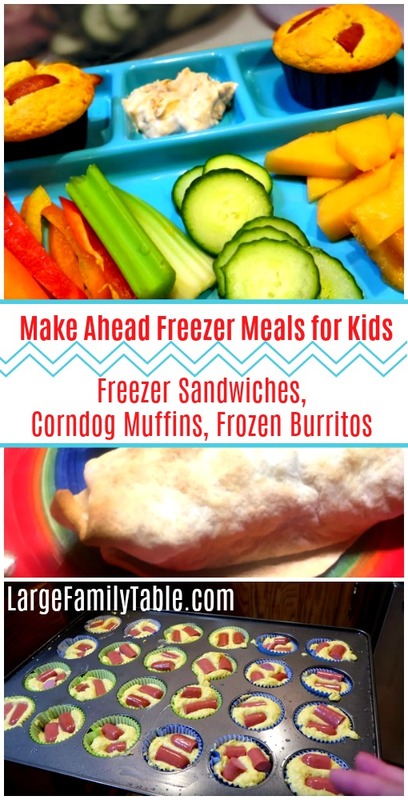 You can click here to watch these easy make ahead freezer meals for kids in action! This freezer cooking session wasn’t as long as my usual freezer cooking times. 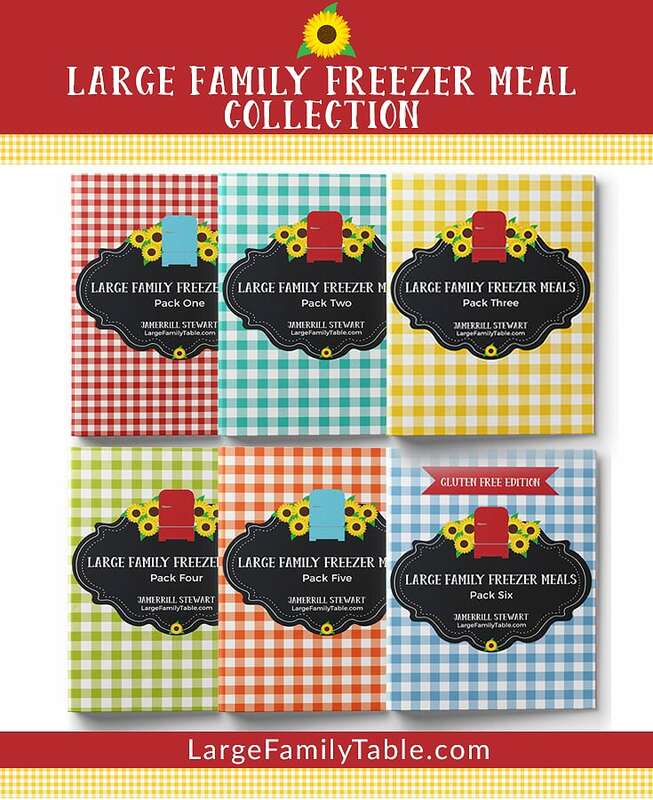 But we got some quick and easy lunch freezer meals that the kids and my husband could handle while I was out of town. I tried to cook ahead enough so all of their breakfasts, lunches, dinners and snacks were in the freezer for the entire week. That’s a lot of food though even though it was “only” for the 7 people total who were at home that week. The kids loved the corndog muffins and finished those off first. We have a few packs of burritos left, although several packs have been eaten. We also have less than 20 freezer sandwiches left. 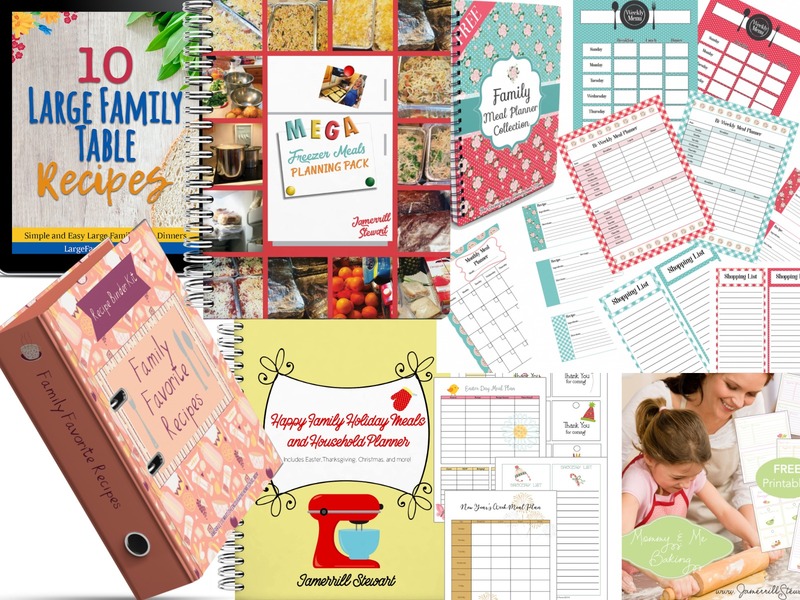 It’s almost time for another freezer cooking day to whip up more freezer meals around here! Be sure to share in the comments some of your family’s favorite make ahead meals for kids. Also, feel free to let me know any make ahead recipes you’d like to see here on Large Family Table!